On the Dashboard the user may choose the Merchant Account he or she wishes to view. The page's title consists of company's name with section's title. Approval % – percentage of transactions approved over compared to last month. Trends are indicated by Up and Down arrows. Refund % – percentage of transactions refunded over compared to last month. Trends are indicated by Up and Down arrows. 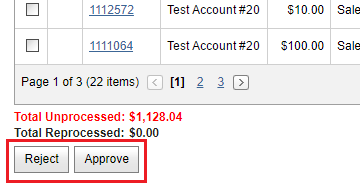 Sales Amount - the total amount processed over the given Date Range. Sales Transactions – the total number of transactions over the given Date Range. Refunds – the total amount refunded over the given Date Range. Credits – the total amount Credited over the given Date Range. Approved – percentage of transactions Approved over the given Date Range. Declined – percentage of transactions Declined over the given Date Range. Rejected – percentage of transactions Rejected over the given Date Range. 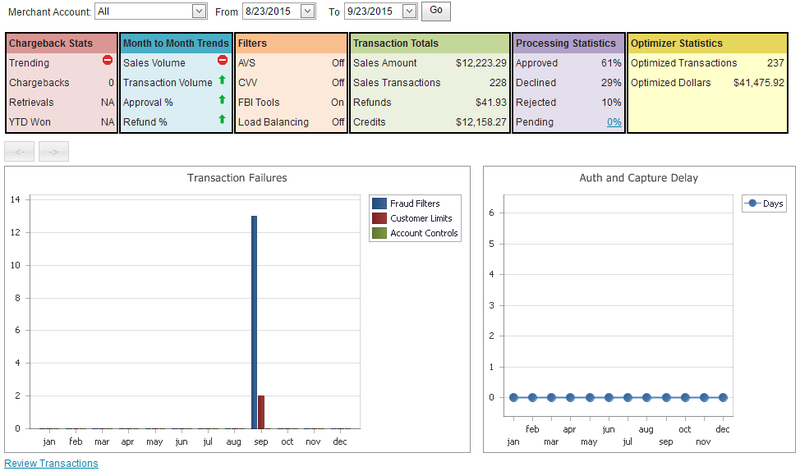 Pending – number of outstanding Flagged for Review transactions over the given Date Range. There is also an ability to Review Transactions that may have been trapped by the Fraud and Risk Management Rules. 1. The first graph (in gold) represents the total number of transactions processed through the gateway given the filter criteria selected above. 2. The second graph (in magenta) represents the total dollars processed through the gateway given the filter criteria selected above. 3. The third graph (in blue) shows the total transactions across all accounts given the criteria listed above. Step 1: Select the Merchant Account from the Merchant Account list box. Step 2: Select the dates From and To. On the Dashboard you will find an option to review transactions that have been flagged by the FBI Tools (Fraud) and/or Account Controls (Risk) modules. The Review Transaction link will take the user to the Review Transactions page where he can make decisions about which transactions to manually Approve and process and which to manually Decline. This feature can also be accessed from the FBI Tools menu. Here the merchant will see the total number of transactions and the total dollar amount of the specified transactions. Step 1: Click on the Review Transaction link. Step 2: Choose a date range: From and To. Step 3: Use the Merchant Account list box to select a Merchant Account. Step 4: Select the Status of transactions. Transactions that have been Declined cannot be processed as they have violated a fraud prevention rule or risk filtered created by the merchant. Tip: Use the Flag for Review option when setting up the system if there is a chance that questionable transactions may be manually approved. Step 5: Click the Submit button and the page will be updated. 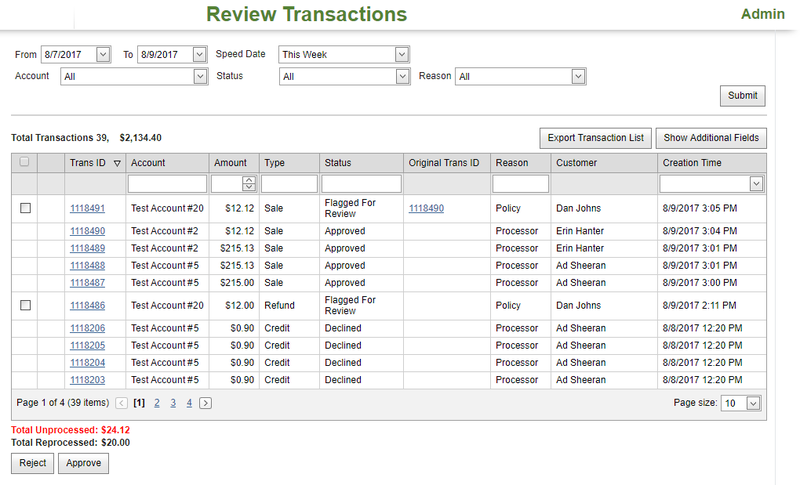 Select the All checkbox to apply a single action to all the transactions in the grid. Available actions are Approve or Reject. Alternately, you may choose to select individual transactions and process them one at a time. Step 7: Approve or Reject transactions. When the merchant clicks on the Reject button, the selected transactions will become failed transactions and their status stored as such. When the merchant clicks on the Approve button, the selected transactions will be processed and those that are approved by the Processor will be handled as successful transactions. Transactions failed by the processor will be stored as such in the gateway. Click on the Export Transaction List button and all selected transactions will be exported to a Microsoft Excel document.